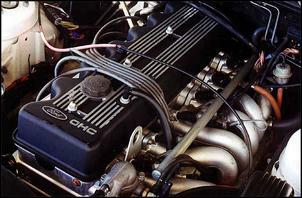 The Ford 3.9/4.0 litre straight-six was released in Australia back in 1988 and, since then, it’s earned a wonderful reputation for power and reliability. The big six has proven capable slogging it out under the bonnet of taxis, home-grown racecars and even the odd power boat. But despite the huge number of Falcons sold from 1988 through to 2002, there’s a strange lack of people interested in hotting ‘em up. And even fewer people have any idea how to. In this two-part series we’ll look back over the mechanical iterations of the SOHC Aussie Ford six and discuss tuning options with Jim and Brendan Mock of J.M.M. (Jim Mock Motorsport). J.M.M. is hands-down the most experienced Ford six tuning workshop we’ve come across. The first batch of EA Falcons was released with a choice of three straight-six engines - a 3.2 litre with throttle-body injection, a 3.9 litre with throttle body injection and a 3.9 litre with multi-point injection. All three engines share the same design except the 3.2 litre has a shorter stroke than the 3.9s – 79.4mm versus a massive 99.3mm. A relatively low 8.8:1 compression ratio is used in each. The biggest advantage of these new engines was the introduction of a pushrod-free SOHC valvetrain, which improved overall efficiency. The EA also adopted roller cam followers and rocker arms. The roller cam followers were based on a similar arrangement to Mercedes-Benz engines of the time. The camshaft – developed by Ricardo – is driven by a double-row timing chain. The aluminium cylinder head carries over a conventional 2-valves-per-cylinder arrangement, but with an extensively developed combustion chamber. The engine management is Ford's EEC-IV system using a MAP sensor to determine engine load. ECU capacity is 32kB. The throttle-body injected 3.2 and 3.9 employ twin Bosch injectors firing into a shared chamber. Six smaller capacity Bosch injectors are used in the multi-point fuel injected (MPFI) 3.9. So how much power are we talking in the EA Falcon range? Well, there are still a few 3.2 litre sixes getting around but with only 90kW/235Nm at the flywheel, you’d be wise to steer clear. Jim Mock (the head of J.M.M.) says the 3.2s were intended as an economy-based fuel efficient engine but, because they had to be revved so hard, there wasn’t much of a saving. Engine life was also relatively short. The throttle body injected 3.9 is a much better proposition with a factory output of 120kW/311Nm. Jim says these are easily better than the 3.2, but the carby-style intake manifold is very restrictive. The pick of the EA engines is the MPFI 3.9 at 139kW and 338Nm. The SOHC Ford six is a very short revver – those peak power and torque figures are achieved at just 4250 and 3500 rpm respectively. Redline is 5000 rpm and the fuel cut-out is set at around 5400 rpm. In contemporary road tests, the multi-point injected EA Falcon auto (weighing around 1450kg) could cover the quarter mile in the mid 16 second range. Five speed manual versions are about half a second quicker. Jim says the MPFI 3.9 litre EA six is a pretty good platform for tuning since most of the later hardware can be adapted to fit. 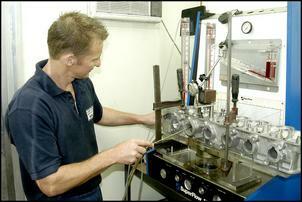 For example, a later camshaft and the EF-onward dual-stage intake manifold can be retrofitted – more on this later. A high kilometre EA 3.9 MPFI is also the perfect recipient to receive a full tear-down that addresses the lowly compression ratio. The EA Falcon was followed by the 1991 EB Falcon, which incorporates several engine revisions. The budget-conscious 3.2 litre and throttle-body injected 3.9 litre engines were dropped and remaining engineering efforts were invested in the MPFI 3.9. The early EB engine was not significantly improved over the EA’s, but the EBII engine was a big step forward. The EBII brought a new crankshaft with extra counterweights (for improved NVH), revised pistons and a reshaped combustion chamber for a slightly higher compression ratio. 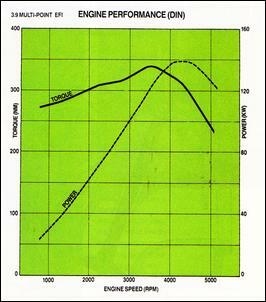 A 35cc extra swept capacity also bumped the engine up from 3.9 to 4.0 litre. Engine management was also remapped. These upgrades give the EBII a tidy power and torque increase. A full 148kW and 348Nm are available at the flywheel at an engine speed of 4500 and 3650 respectively. Curiously, the quarter mile times seem virtually unchanged. The next model is the 1993 ED Falcon. The ED Falcon is a strange step backward in terms of performance. Jim Mock says the camshaft was detuned from EBII specs and, as a result, power slipped from 148 to 145kW. This might not seem much, but we’re told that the on-road lack of performance was noticeable. From a tuning perspective, the ED engine only makes things harder compared to the EBII engine. The most groundbreaking development during the early days of the E-series Falcon range was the introduction of the go-fast EB Falcon XR6. Ford Australia called upon its Tickford tuning division to give its straight-six enough grunt to blow Holden’s V6 into the weeds. Tickford responded with a high-flow cylinder head, higher compression ratio (9.1:1), altered cam timing and cam profile, upgraded valve springs, colder spark plugs and a low-restriction exhaust. The EEC-IV ECU was also remapped and a new fuel pressure regulator was installed. The result? A then-amazing 161kW at 4600 rpm and 366Nm at 3650 rpm – just 4kW and 22Nm behind the contemporary 5.0 litre XR8! There was a huge amount of hoo-ha surrounding the release of the XR6 and plenty of effort was put in to achieve the fastest possible acceleration times. These efforts resulted in a high 7 second 0 – 100 and a 15.6 second quarter mile time. Note, however, some of this extra speed came from a shorter diff ratio. Jim Mock recommends the XR6 as a good platform for tuning. The factory low-restriction exhaust is typically replaced early in the piece, but the improved cam, head and ECU program provide distinctly better power than a similarly modified garden-variety Falcon. "All the little improvements add up," says Jim. 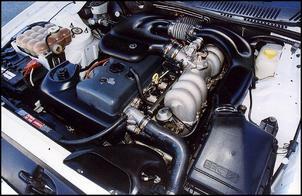 The 1994 EF Falcon upgrade brought major technological improvement to Ford’s big six. 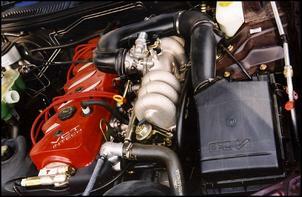 Most important is the sophisticated dual-stage variable intake manifold. This manifold employs long runners at low rpm and a valve switches it to short runner mode at higher revs. The high-tech intake manifold serves to optimise engine breathing across the rev range. Note that the induction system leading into the manifold was also significantly changed - a ‘divided passage’ pipe can be found passing over the rocker cover. In addition to the new induction set-up, the EF engine received another crankshaft revision, a slightly increased compression ratio, the head was slightly improved (including larger ports and runners) and various other inconsequential changes were carried out. The rev limit was also increased to 5700 rpm and it appears that the knock sensed EEC-V management system was adopted at this time. Note that a coil-pack ignition system replaced the conventional dizzy. The much-improved EF Falcon 4.0 churns out 157kW at 4900 rpm and 355Nm at 3000 rpm. An auto-trans EF Falcon GLi is capable of running a low 16 second ET. Both Jim and Brendan Mock agree that the EF Falcon engine is a great choice for modification. The dual-stage manifold is worth its weight in gold and the cylinder head improvements are also valuable. Interestingly, Jim says some EF models use an XR6 cam profile – even although they share the same markings as a conventional EF Falcon cam. These cars are a lucky find – they respond very well to power-up modifications. Meanwhile, Tickford was hard-pressed to extract any more power for the EF XR6. In EF guise, the XR6 makes ‘only’ 164kW and 366Nm – just 3kW more than the early XR6. 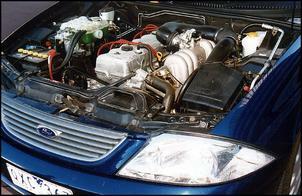 Improvements over the base EF Falcon engine were similar in nature to the initial XR6. Mods include an enhanced cylinder head (including reshaped runners and 41mm exhaust valves instead of the standard 39mm items), a tad more compression, a new camshaft, 5 percent stiffer valve springs, colder spark plugs and a low-restriction exhaust. A recalibrated knock sensor and remapped ECU were also required. With all of these changes giving a small 7kW improvement, it was clear that the SOHC 4.0 litre six had little scope for more power (within the confines of a mass produced vehicle). Many owners complain their EF XR6 is barely any quicker than a conventional EF Falcon or early XR6. Improved driveability and torque spread are its biggest advantages. The EL Falcon – released in 1996 - brought only minor mechanical changes. The most significant alteration was the step back to a dizzy-style ignition system. We’re told there were numerous coil-pack failures in the EF Falcon. The ‘divided passage’ air intake pipe between the airbox and throttle was also changed to a simpler large-bore pipe. There may have also been another small compression ratio upgrade, but the factory quoted power figures remain unchanged from the EF. 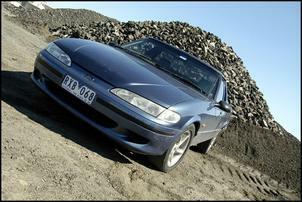 The performance of the 1536kg EL Falcon remains similar to the EF Falcon – low 16s down the quarter. In terms of tuning potential, the EL is almost as good as the EF – its relatively restrictive pre-throttle induction pipe and distributor-type ignition are the most important variations. In 1998, Ford released the controversial looking AU Falcon. The AU engine incorporates numerous changes, but none result in more power. The AU block was recast for improved NVH, the crankshaft’s main bearing diameter was enlarged, a cast alloy sump was bolted on and a coil-pack ignition system was again fitted. Lightweight hypereutectic pistons with short skirts and thin rings were installed along with longer rods (to accommodate the shorter piston pin height). Compression ratio was also bumped up to a claimed 9.6:1. Weighing slightly more than the EL model, the AU Falcon achieves similar mid-to-low quarter mile times. Note that some of these alterations were phased in with the last EL Falcons – these were fitted with a so-called hybrid engine using AU-spec head, cam, valves and springs. We’re told that Ford ‘pre-released’ engine changes in several models, so not all models are identical. 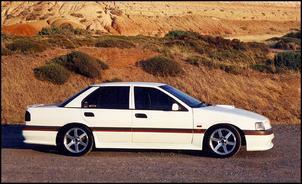 And what about the XR6 version of the AU Falcon? Well, up against a brick-wall with the standard engine configuration, the AU-series XR6 makes exactly the same power as the EF – 164kW. 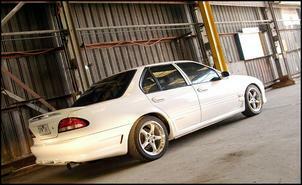 However, a new addition was made to the AU XR6 line-up - the Tickford XR6 VCT. The XR6 VCT brought variable cam timing to the SOHC motor to achieve 172kW/374Nm. 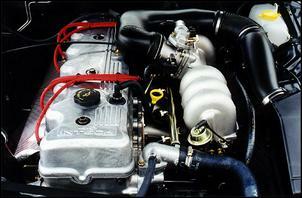 This goes down in history as the most potent factory-produced SOHC version of the Falcon six. It achieves high 15 second ETs in the AU body. Note that the same engine – but strangled by a restrictive exhaust – is fitted to the Fairmont Ghia/Failane of the same era. Output is down 4kW compared to the XR6 VCT. Stay tuned – in Part Two of this series we’ll delve into modification!